With special thanks to Conjuror Community Contributor Alex Sladman! Want to learn a great new card trick? If you can steal a selected card from the deck, you can produce it from any impossible location you can think of, from your pocket, to a wallet to a sealed piece of fruit. For that reason, it’s one of the most valuable moves in the card trick arsenal of any close-up magician. At the same time, most of our clients find this to be a daunting, even scary sleight to tackle. 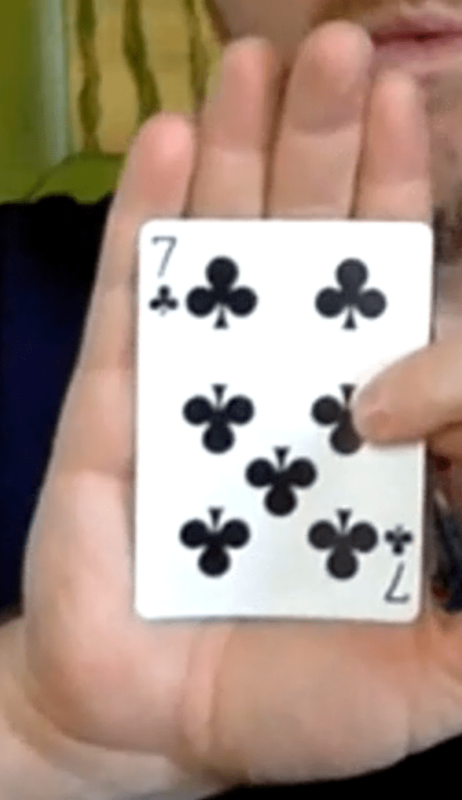 Whether you’ve never palmed a card at all, or you’ve been palming for 20 years, you’ll find the method we’re about to share in this easy card trick will make the secret art of palming easier than ever to master. BTW – At my most recent online class at Conjuror Community, I shared one of my favorite routines using this palm that makes this sleight even easier to accomplish (the routine itself does nearly all the work for you!). With Special Thanks to Alex, one of our Conjuror Community members and contributors, for doing such an excellent job preparing this article! This is your “hypothesis” position – just like most every card trick, as there really is no ‘one size fits all solution’. In fact, after you test the palming action we’ll describe, your personal palm position will likely change a bit. As you practice, the lower left corner of the card will adjust a bit until it sinks into your personal perfect position. Before we describe the palming action itself, keep this in mind: The cards will get bent…a whole lot. In ‘card trick class’ that’s one thing they never tell you about learning to palm cards – and it’s a good thing. That’s how we’ll ensure you never get caught, or even suspected of trickery, in performance. 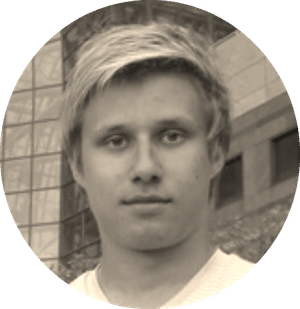 Alex Sladman is a talented sleight of hand artist and a contributing member of Conjuror Community. He’s responsible for the clear, easy to follow instructions in this post! Now that we covered your palm position ‘hypothesis’, let’s look at the action of the palm itself. 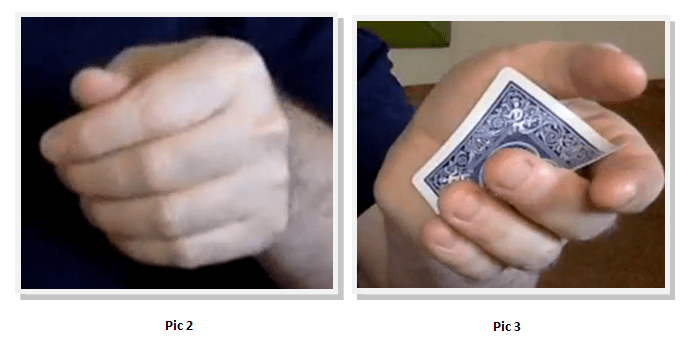 Like most bottom palms, this method is derived from the Erdnase Bottom Palms in Expert at the Card Table. However, thanks to your Personal Bottom Palm Position and unique approach you’re about to discover, in card trick land, the Autopilot Bottom Palm is the easiest, most deceptive method we’ve ever seen. One of the big secrets behind the Autopilot Bottom Palm – and almost every intermediate or advanced sleight in magic, is the concept of Micro Moves. It’s a single secret action that takes no more than a moment to accomplish. That’s important, because we can only direct the audience’s attention for one moment at a time, so any sleight that takes longer than a single moment, must be broken up into smaller units…so we can use our core Attention Jacking tactics of Open and In-transit actions to direct the audience’s attention away from the deck during each of the two Micro-Moves that combine to form the Autopilot Bottom Palm. In the first secret Micro-Move, you’ll transfer the deck to the right hand as you prepare the card for palming. The right thumb holds the cards firmly. The left hand releases all pressure on the deck except for the first finger pad pressing up on the bottom card at the upper right corner. Hold the bottom card still with the left first finger as the right hand rotates the deck counter-clockwise, using the bottom left corner of the bottom card as a pivot post, so the deck rotates away from the bottom card. This is a slight action. This action is invisible, but you’ll use simple Attention Jacking Concepts to make sure the audience never suspects a thing. As your left first finger moves into position below the deck for the move, shift your gaze to the spectators on your left as you say something to them. 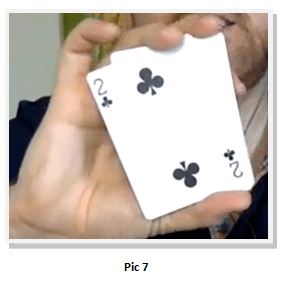 Then, a moment later, as the left hand releases the deck, use it to gesture toward those same spectators on the left. Note: This gesture is referred to as the Open Action. The secret action of shifting the bottom card of the deck in readiness for the palm is the secret action, done In-Transit. These technical terms were coined by the spanish master Ascanio, but simply put, it means that your gaze shifts and draws (or at least splits) the attention of the audience. The transfer of the deck from hand to hand is now justified as it seem motivated by your desire to ‘free up’ your left hand and gesture toward the spectators on your left. 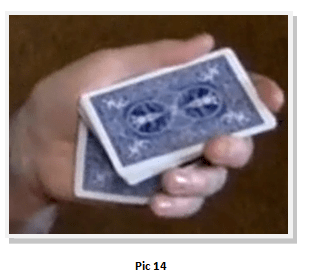 The In-Transit Action – transferring the deck as you prep the bottom card for palming – becomes psychologically invisible. That’s important, because unmotivated actions raise suspicion. And once the audience is on ‘high alert’ they start tuning out what you say and focus only on your hands. Once that happens, your odds of amazing the audience go down drastically. Access your complete Autopilot Card to Pocket video training now in Conjuror Community. It’s the easiest method ever devised. You’ll be ‘palming cards like a master’ in no time! Click here to access your Video Training. Not a Conjuror Community member? 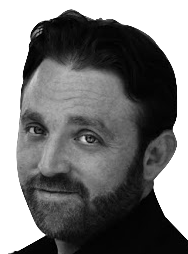 Click here to learn more about Conjuror Community. Now you’re all set to palm the bottom card of the deck in your left hand without any suspicious actions. In fact, you’ll barely move a finger! To the audience, it will look as though you simply place the deck back into your left hand. The palming action is totally invisible and natural. Even so, we use the same Attention Jacking Strategy to ensure no one in the audience gives it any thought. As your right hand moves to deposit the deck in the left hand and palm the card , shift your gaze to the right and speak. Then, as you complete palm and your right hand releases the deck, use the right hand to gesture toward the right. Just as before, this Open Action – preceded by your shifting gaze – justifies the In-Transit transfer of the deck and ensures even the most attentive or difficult spectator won’t have a clue what you’re up to. Now the card is safely held in bottom palm below the deck. We suggest you take advantage of the safety this position gives you and wait at least a few moments before stealing the card away from the pack. This action is known as ‘retiring’ with the card, and thanks to your unsuspicious movements up to this point, you’ll have an easy time of it. Simply ask a person to shuffle and take the deck with your right hand and give it to them. Or use the right hand to slap the deck on the table. As you do, curl the left fingers and naturally drop the left hand to your side or lap (so you don’t seem to rush!) and then move to produce the card from your pocket, wallet, envelope or any place you desire.